The three months of winter are called closing and storing. Do not disturb the yang at all. Early to bed, late to rise. (One) must await the daylight. Make that which is of the heart/mind as though hidden, as though concealed, as though (one) has a secret intention, already obtained. Leave the cold, seek warmth. Do not leak the skin (sweat). Urgently hold onto the chi. This is the winter compliance of chi and the cultivation of the Dao of storage. To oppose these principles injures the kidneys. (Consequently) spring will bring paralysis and fainting (and) there will be little to offer one’s sprouting. Winter is the time of the kidneys, which must be protected and nourished. This is done by storing our energy rather than expending it. It is the most yin of the seasons. When the weather turns cold everything in nature goes to sleep. As the Yellow Emperor’s Internal Classic, the Nei Jing, tells us, ideally we should reduce our activity, go to bed earlier and get up later so as not to ‘disturb the yang at all’. 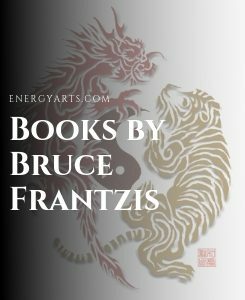 Like fish sinking to the bottom of an icy pond, or like a daffodil bulb in the cold ground, we should let our energy sink deeper inside us. This is not the time to start jogging or aerobics or anything else that makes you sweat. Avoid rushing around. Instead go to bed early and get up late. Stay inside where it’s warm and rest. Your mind also needs to rest. The kidneys are closely associated with the fundamental drive that is called ‘zhi’ (志) in Chinese. Zhi is often translated as ‘will-power’. Most fundamentally, it is the survival instinct, that which keeps us going in the darkest times. In less extreme situations, it is that which identifies and works towards goals and things that we want. It is the zhi that is spoken of in our passage on winter that says, ‘Make that which is of the heart/mind (zhi) as though hidden, as though concealed’. Now is not the time to activate the zhi, which would call on the energy of the kidneys. Rather, we should put away our desires in winter and let them rest. Offence: there is none greater than desiring gain. Knowing enough of enough is reflected in our passage from the Nei Jing in its instruction that we should make the heart/mind ‘as though (one) has a secret intention, already obtained’. It is usually with the attainment of our desire that we are, if only briefly, satisfied and able to truly relax. These passages point to a more subtle option, that of letting go of desire itself, which leads to a much more profound and enduring stillness. Winter follows autumn, when ideally we gather that which nourishes us and let go of that which is no longer of use to us. It is now time to store what we gathered and to allow our systems to rest in stillness. The dominant element now is water, which naturally flows downward, cleanses, nourishes and goes very calm and still when not disturbed. When water is still, the sediment settles out of it and it becomes clear and reflective, like a mirror. 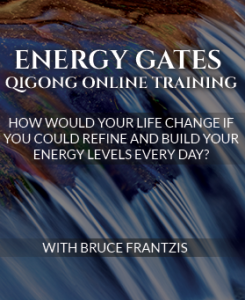 Energy Gates qigong is a powerful winter practice. It activates the water element in the body. 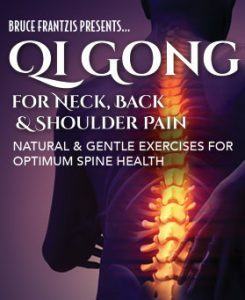 Standing is very yin, as is Cloud Hands,when you focus on the downward flow of energy. These practices strengthen the kidneys and help them store energy better. 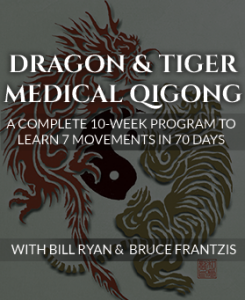 If you practice Tai Chi or qigong, make your form as smooth and liquid as possible, attending more to the downward flow. Focus on making your hands and feet very soft. Avoid stopping to correct yourself, simply note any mistakes you make for next time around. Let go of the desire to accomplish anything in your practice. Ideally, lie down and rest for a while after your practice and gently put your attention on your kidneys. Let all of your energy collect there. During the day 3-5:00 pm is a particularly good time to rest as it is the time that the kidney system is strongest. Hold on to your chi and hibernate.